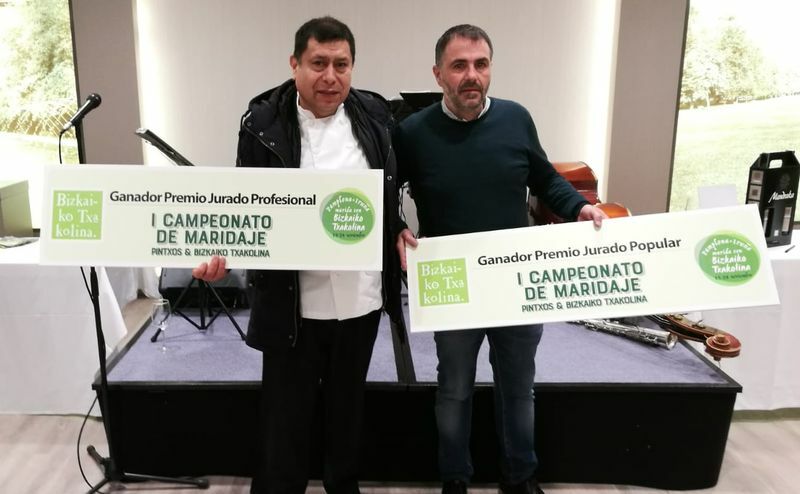 The First Pairing of Pintxos and Bizkaiko Txakolina (Txakoli of Biscay) Competition which has been held in Pamplona-Iruña between 16-24 November has proven to be a great success and will undoubtedly entail a qualitative leap for the presence of Bizkaiko Txakolina (Txakoli of Biscay) in Navarre. Twenty-one (21) hospitality sector establishments from the capital of Navarre have participated, and which paired their creations with 11 txakoli brands from many other wineries of our AOC. The level of the creations entered into competition has been very high and the pairings have been particularly successful in all cases. The wineries of our AOC which have participated in the event have been: Berroja, Doniene Gorrondona, Gorka Izagirre, Itsasmendi, Lapazarán, Magalarte Lezama, Magalarte Zamudio, Mendraka, Munetaberri, Torre Loizaga and Vírgen de Lorea. The winner of the first prize awarded by the professional jury was the El Goloso bar with a creation paired with the 2017 Lapazarán. The popular vote prize was awarded to Rex Casa de Comidas, who paired its pintxo with a 2017 Gorka Izagirre.